Heel pain is most often caused by plantar fasciitis, a condition that is sometimes also called heel spur syndrome when a spur is present. Heel pain may also be due to other causes, such as a stress fracture, tendonitis, arthritis, nerve irritation, or, rarely, a cyst. Because there are several potential causes, it is important to have heel pain properly diagnosed. A foot and ankle surgeon is able to distinguish between all the possibilities and determine the underlying source of your heel pain.What Is Plantar Fasciitis? Plantar fasciitis is an inflammation of the band of tissue (the plantar fascia) that extends from the heel to the toes. 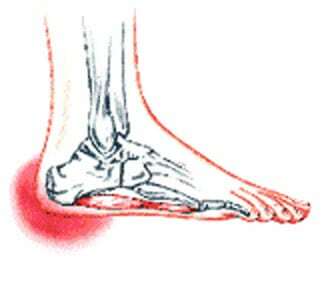 In this condition, the fascia first becomes irritated and then inflamed, resulting in heel pain. The most common cause of heel pain in adults is plantar fasciitis, which is an inflammation of the band of tissue in the sole that connects the heel to the toes and forms the natural foot arch. Plantar fasciitis may or may not be complicated by a calcaneal spur, a small bone growth that protrudes out of the heel. Plantar fasciitis may also be referred to as plantar fasciosis. In contrast to fasciitis, which essentially means inflammation, fasciosis refers to degeneration of the tissue. In fact, if left untreated, acute plantar fasciitis may develop into a chronic painful condition, which results in slow and irreversible degeneration of the fascia, hence plantar fasciosis. The location of the pain is usually exactly under the heel but may also occur in the arch of the foot. Pain typical to plantar fasciitis is that which feels worse when arising on to your feet such as in mornings or after sitting down for a while, and usually progresses in severity when left untreated. Make sure you wear appropriate supportive shoes. Don't over-train in sports. Make sure you warm up, cool down and undertake an exercise regime that helps maintain flexibility. Manage your weight, obesity is a factor in causing plantar fasciitis. Avoid walking and running on hard surfaces if you are prone to pain. You should follow the recognized management protocol "RICED" rest, ice, compression, elevation and diagnosis. Rest, keep off the injured ankle as much as possible. Ice, applied for 20 minutes at a time every hour as long as swelling persists. Compression, support the ankle and foot with a firmly (not tightly) wrapped elastic bandage. Elevation, keep foot above heart level to minimize bruising and swelling. Diagnosis. Consult a medical professional (such as a Podiatrist or doctor) especially if you are worried about the injury, or if the pain or swelling gets worse. If the pain or swelling has not gone down significantly within 48 hours, also seek treatment. An accurate diagnosis is essential for proper rehabilitation of moderate to severe injuries.